CHEFTRONIC---Professional; Powerful; Affordable and Guaranteed! 1. The practical and time-saving CHEFTRONIC stand mixer with a powerful 650W motor and handy 6-speed control to make it perfect suit for kitchen. 2. 5.3QT stainless bowl provide sufficient capacity to meet you need and it is easy to clean. 3. Circular splash guard, avoid a spattering when mixing and adding ingredients, keep the kitchen tidy. 4. Tilt back head have three functions of replacing the bowl and accessories to facilitate the addition of ingredients. 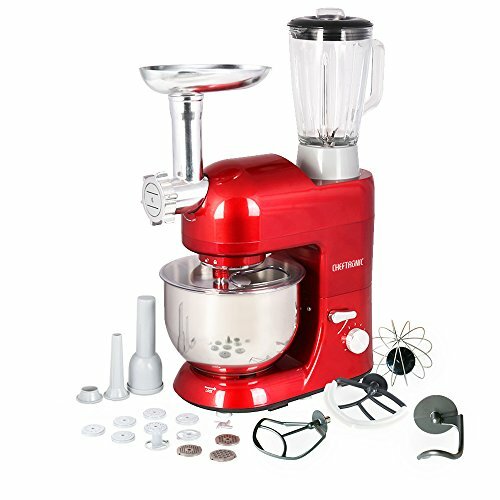 5.The feature attachments of Meat grinder, Sausage stuffer, Pasta maker and Blender are great for sausages, pasta, ice fruit juice and so on. Multifunctional Stand Mixer will do all what you want! 3. Housing Style: Sturdy ABS Housing. LARGE CAPACITY BOWL & PRECISE SPEED CONTROL : 5.3 Qt. stainless steel bowl, large capacity to mix dough for 9 dozen cookies or 4 loaves of bread in a single batch. Precise 6 speed control lets you from a slow stir to a fast mix, prefect suitable for different ingredients. Easy to use and clean. TILT-HEAD & A PIECE OF SPLASH GUARD: The tilt-head design allows access to installing or uninstalling bowl and accessories. The splash guard helps you add ingredients when mixing without mess. Make your cooking more fluent! POWERFUL MOTOR & ANTI-SLIP DESIGN: 650w high performance motor and high durable plastic housing. Anti-slip design makes stand mixer steady while the stand mixer is working. CHEFTRONIC SM986 Stand Mixer has four silicone suckers which are useful for keeping machine fixed. If you have any questions about this product by CHEFTRONIC, contact us by completing and submitting the form below. If you are looking for a specif part number, please include it with your message.